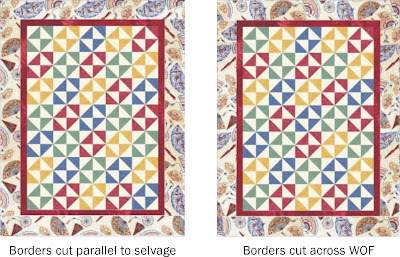 “Quilters are usually taught to cut quilt borders parallel to the selvage. There are a couple of good reasons for this. 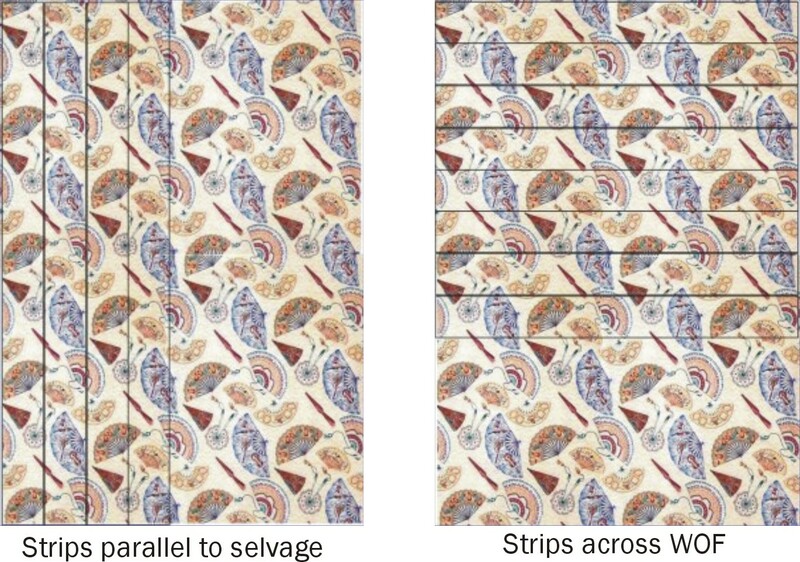 First, there is less stretch in the fabric parallel to the selvage so less likelihood of wavy borders. Second, the borders would not need to be pieced with adequate yardage. But we all know there are no quilt police and there are good reasons to occasionally break the quilting ‘rules.’ I often cut my borders across the width of the fabric (WOF) from selvage to selvage. The borders usually need to be pieced but less fabric is required. And if the fabric is one of those large-scale prints so popular today, the borders may look better cut across the fabric width. 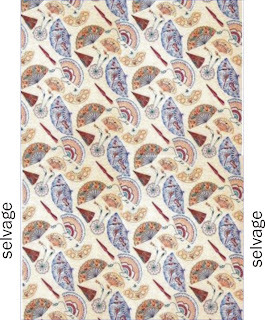 For example, here is a large-scale print I want to use as the outside border for my quilt. For the next figure, I have superimposed cutting lines on the fabric to show the difference in the appearance of the borders after the fabric is cut. Although there is quite a bit of the blue I want in the print, some border strips cut parallel to the selvage will have almost no blue. 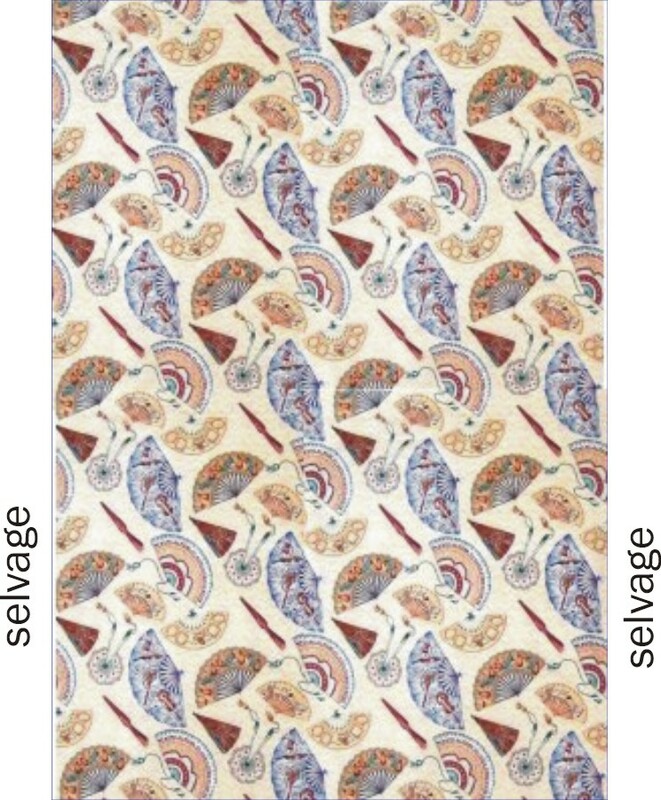 Also, the same motifs repeat often in a lengthwise border strip. 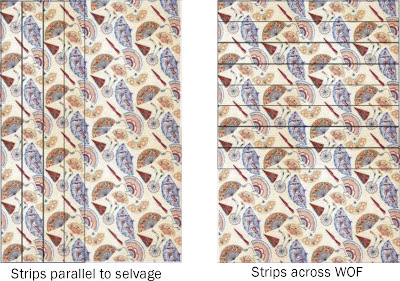 The border strips cut selvage to selvage have more variety in color and motifs. See the difference in these quilt mock-ups below. The quilt with the borders cut across the WOF is more balanced and interesting to look at. Why not cut the fabric diagonally? You could have strips that are entirely blue fans. Of course, this cutting decision would require EXTREME CARE in handling the cut fabric to prevent ugly stretching. Some of that care might be reduced if you "cut" the fabric by running it through the serger after drawing straight lines onto the fabric to follow as you serge. The serger would provide a stablized edge (and the serger thread would also give some additional padding under the binding). Thank you for the confimation. I usually always end up not having enough fabric without piecing anyway, so I just do the selvage to selvage and then I'm careful to use the design to mix or match as I like the results. LOL, the only Quilt Police around is yourself! We were just talking about quilt police at our bee today….we decided that quilts show one's own creativity and so we should do what pleases us not what the "rules" say. I often do my borders with WOF cuts! Gee, if I wanted a lot of the blue I would likely have just spaced my cuts so each one had the blue, but the wof if fine too. I typically find the wavey borders when people are trying to adjust out the piecing errors in the center of the quilt. Typically people will add extra instead of subtracting and this always makes a wavey border. 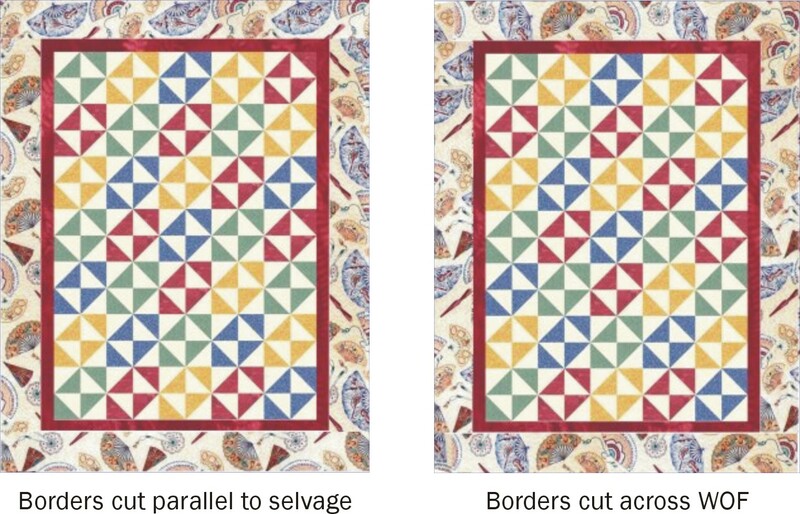 After many trials with cutting borders and piecing border and finally quilting borders – I decided that I would break the ultimate rule – I would stop designing borders on my quilts LOL!! I do occasionally add one but if I can do without – I do without. Gives my quilts a whole new look! Thanks for the encouragement to break the rules and defy the quilt police. I have seen many a potential quilter be discouraged from quilting because of the quilt police. There are many ways to quilt and many reasons for quilting. There is not just one way. I've actually done diagonal cuts of fabric for the borders….and yes, it's tricky…but the look was worth it! When using a large print for a border, I often cut both lengthwise and crosswise pieces for the border to have the print go the “right” way on all sides. This is especially useful when using a one-way print.